This is a great add-on that I use all the time. Could you please add the option to allow the user to decide if they'd like to rename the file before saving? Thank you! I use the icon to save my files and it pops up a screen with all the info regarding your save, including the file name at the top which you can change. Is there anyway to get the url of the current page using this addon, rather than clicking on a link on the page? This extension desperately needs an update for it to work with the latest versions of FF (and Nightly). It's one of the most convenient extensions to save files directly where they belong. Please have a look at it sometime. is there any other competing addons that are just as easy ? would prefer to Keep using this one ! Is the Save File to add-on also available for Thunderbird? So this isnt getting an Update ? pintassilgo wrote: Not yet for me. Could you please public this addon for FF > v57 ? I'm confused. This looks like a good addon, but I'm not sure which versions of Firefox are supported. Looking for 56, 57, and 58. DN123ABC wrote: I'm confused. 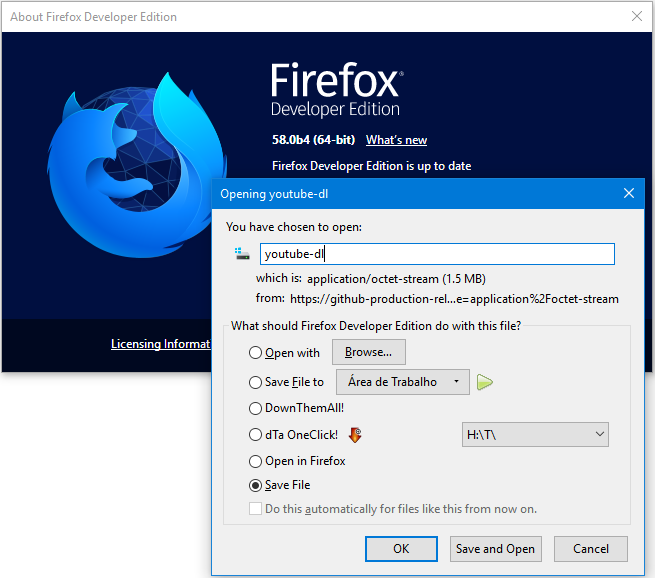 This looks like a good addon, but I'm not sure which versions of Firefox are supported. its one of the best xul addons ever made .. its up there with treestyle tabs imho ..